The Northern right whale (Balaena glacialis) is a large, rotund animal with an enormous arched head about one third of the overall body length. It's blowholes are well-separated, resulting in an almost vertical, V-shaped blow. The head is typically covered in rough cornified patches (callosities) inhabited by whale lice parasites, which give the patches a cream or orange colouration. These may occur on the top of the lower jaw and the region just behind the blowholes, on the lower jaw, and above the eye (photo below), and may be used in photo-identification of individual animals. Right whales have no dorsal fin or ventral pleats, the flippers are short and broad, and the tail flukes are broad with smooth concave trailing edges, a distinct notch and pointed tips. Adults are generally uniformly dark in colour, except for scars, belly patches and the callosities on the head. The upper surface and underside of the flukes are dark, but the bellies have light patches which typically vary between individuals - from none at all, to very large white patches which almost entirely cover the abdomen. There are 205-270 pairs of baleen plates in the right whale, and the plates and bristles are usually dark grey to blue-black (although they can be pale grey or white towards the front of the mouth). The plates are extremely long in this mysticete compared with those in other whales, although not as long as the baleen of the bowhead whale. The maximum length of a plate has been recorded at 2.8 m in a 16.4 m long whale, although they are usually no more than 2.2 to 2.6 m in length. These whales are slow swimmers and can exceed 12 km per hour only in short bursts. They are not regarded as deep divers, since most of their prey is close to the surface and maximum submergence times are rarely more than 20 minutes, although they often raise their tail flukes in the air at the beginning of a long dive. Perhaps surprising for such large, bulky animals, right whales can be very acrobatic and demonstrative, and their surface behaviour may include breaching, lobtailing and slapping the water with their flippers. The northern right whale favours inshore waters, shallow bays and banks and estuaries of the Northern Hemisphere. The species can be very coastal in habit and in some studies all sightings of right whales have been recorded within 15 nautical miles of land and in less than 10 fathoms of water. The whales apparently move from subpolar regions to lower latitudes, remaining near to continents or land masses. 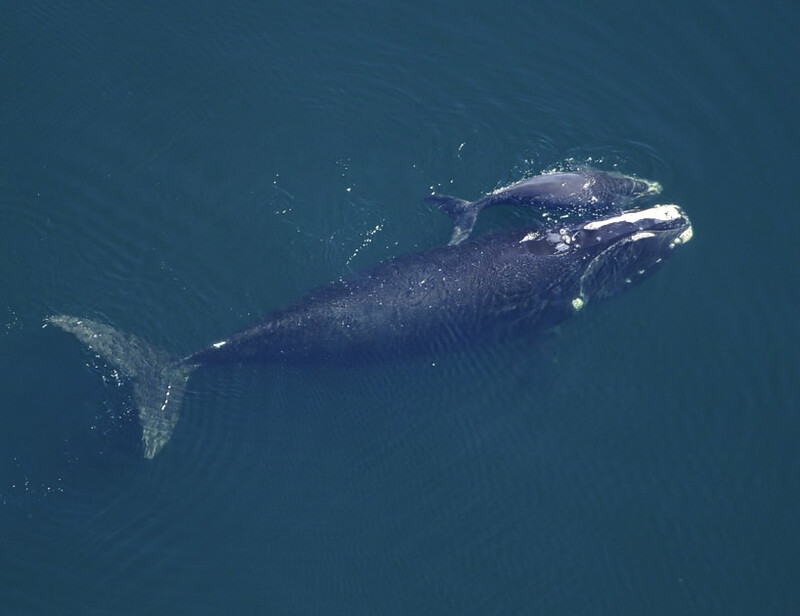 Studies have revealed that some female right whales migrate as far as 3,000 km from the northern summering grounds to the south-eastern US Atlantic coast during the winter months, for calving and rearing of young. The location of other wintering grounds and the migration routes and timing are unknown for the species, however. This large mysticete was once abundant along all major land masses in the temperate latitudes of both hemispheres, but today current population estimates for the Western North Atlantic range from just 100 to 640, with a generally accepted average of 300 to 350 individuals. The total remaining North Pacific population has been estimated to be as low as only 200 animals. These Atlantic and Pacific populations in the Northern hemisphere are geographically separate and are considered by some to be separate subspecies. In the eastern North Atlantic, right whales once ranged from the Azores, northwest Africa and the Mediterranean, to Iceland, the Faroes, Shetland, the Hebrides, Greenland and Spitzbergen. The Bay of Biscay was once an important wintering ground. In the western North Atlantic, their range extends from Florida to the Gulf of St. Lawrence and the coasts of Nova Scotia, Newfoundland, and possibly Southern Greenland. During the 20th century, there have been sightings recorded from areas such as Greenland, Bermuda and Texas, but observations are concentrated in five areas: coastal Florida and Georgia; the Great South Channel, East of Cape Cod, Massachusetts; Cape Cod Bay and Massachusetts Bay; the Bay of Fundy and Browns & Baccaro Banks, and South of Nova Scotia. Sightings also occur in the waters between these areas, and additional areas may also exist, since recently collated photographic and genetic data indicates a segment of the population that is not often seen in the known habitats. In the eastern North Pacific, right whales can be found from central Baja, California, to the Gulf of Alaska and the Bering Sea. Since the middle of this century, there have also been sightings by Japanese and Russian whaling boats and a few scattered sightings from the West Coast of the USA. In the Western North Pacific the right whale probably once ranged between Taiwan and the Bonin Islands, north to the Kamchatka peninsula and the Sea of Okhotsk, but it seems unlikely that many remain there now. Right whales can reach lengths of upto 18.3 m in females and 17.1 m in males. At a length of 16 to 17 m, northern right whales may weigh up to 100 tonnes, but average at 50-56 tonnes. Males become sexually mature at a length of 15 m and females at 15.5 m, and are full grown at 16.5 m and 17.3 m long respectively. They probably reach sexual maturity between 5 and 10 years of age, and mate from December to March, which is also when most calves are born. Recent studies suggest that the gestation period of the northern right whale is between 13 to 14 months, with a single calf produced every 3 to 5 years. The cows segregate themselves from the rest of the population to give birth and nurse their young, the calves usually nursing for 8 to 12 months. In the north Pacific, right whales feed primarily on several species of calanoid copepod and, to a lesser extent, on euphausiids - the extremely long baleen providing a large surface for efficient collection of these small to medium-sized plankton.. These animals are specialist feeders. They may be seen skimming through heavy plankton slicks on the surface with their mouths open, the water flowing through the baleen plates to the outside producing an audible rattling sound. Most feeding takes place when the right whales are underneath the water, however, whilst swimming through patches of concentrated plankton with their mouths open. There is a gap in the baleen at the front of the mouth that allows the water to flow freely into the mouth. The baleen strains the zooplankton from the water, catching it on fine, brushy fringes. Northern right whales are seen mostly in small groups less than 12 animals, but most typically in singles or pairs. Larger groups may form on feeding / breeding grounds, however. Surface activities involving several right whales in courtship behaviour have been observed year round. During courtship activity, the whales aggregate in compact groups with several males engaging in efforts to mate with one or more females. This activity may continue for an hour or more, with whales continuously present on the surface. These groups are normally oblivious to boats and do not respond to vessels even at close range. Studies indicate that this socialising continues through the summer into the autumn. In winter, however, cows and new-borns may be segregated from the rest of the population in calving. These animals often exhibit curiosity about objects in the water and seem to interact peaceably with smaller cetaceans and pinnipeds which may frolic behind them or ride in their bow wave.